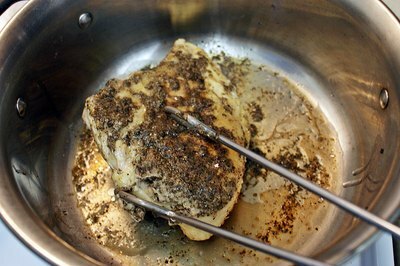 One of the most basic methods of cooking chicken breasts is baking. 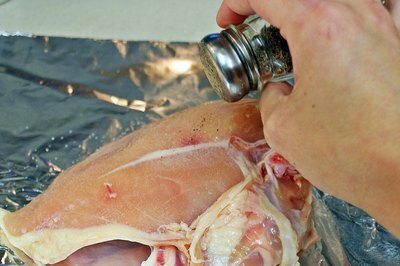 Properly seasoning the meat will ensure it has flavor, but the most important thing is to avoid overcooking the white meat. When overcooked, the meat will become stringy, tough and dry. 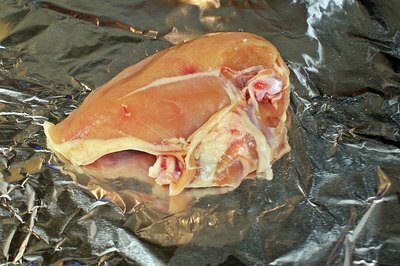 When preparing to cook bone-in chicken breasts it's important to lay the meat skin side down so the meat can lay in its juices. 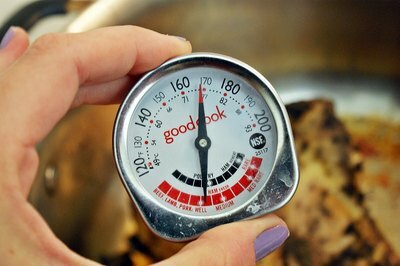 This, along with checking the internal temperature of the meat, will help prevent the white meat from drying out. Rinse the chicken breasts with cold water. Place the meat in a roasting pan. Mix together 1 tbsp. 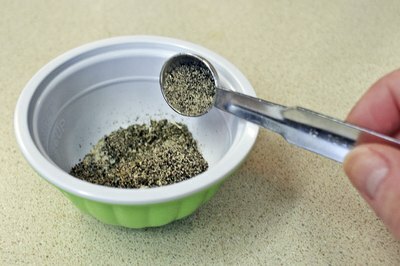 each of seasoning salt, garlic powder, black pepper and 1 tsp. ground sage. 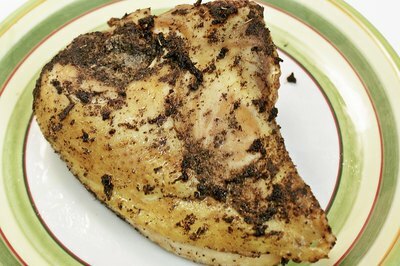 Rub the chicken with olive oil and sprinkle the seasoning mixture on both sides of each chicken breast. Lay the bone-in chicken breasts skin side down in the pan. 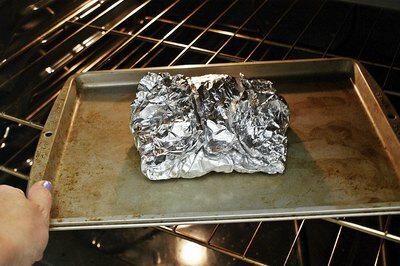 Cover the pan with aluminum foil and place it in the oven. Cook the chicken breasts for 25 minutes. Take the pan from the oven, remove the foil, flip the chicken over so the skin side is facing upward and put the pan back in the oven. This will allow the skin to crisp. Check the temperature of the meat. Chicken breasts are safe to eat once the internal temperature reaches 160 degrees Fahrenheit. Rinse chicken breasts with cold water. Place each chicken piece on its own sheet of aluminum foil. Season each breast with seasoning salt and pepper. 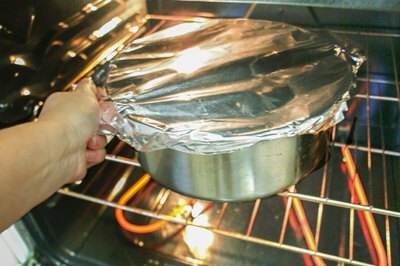 Place the skin side against the foil. 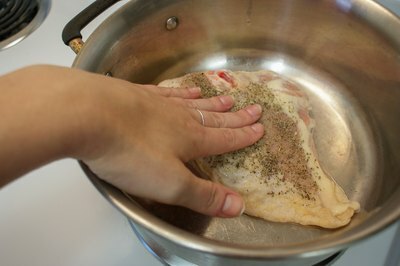 Hold the chicken with one hand and use a knife to slice a slit in the side of each piece of meat. Scoop your favorite pre-made stuffing into the chicken breast cavity. Fold the aluminum foil around the chicken to make individual, stuffed chicken breast packets. 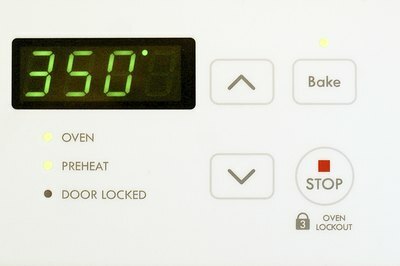 Place the chicken packets on a baking sheet and insert the food into the oven. Cook the meat for about 30 minutes. Remove the meat from the oven, open each aluminum foil packet and flip each breast skin side up. 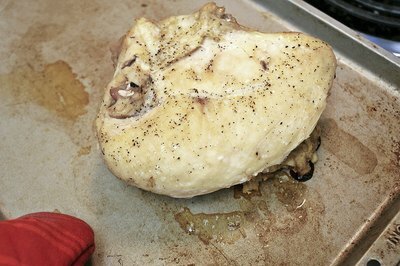 Place the chicken back in the oven for an additional 10 minutes or until the skin is a golden brown color. The meat has finished cooking when you can poke it with a knife and its juices run clear.